How many of you are NION Beauty users? I am one of the loyal user since NION Beauty been introduced to me. Check my review about NION Beauty by clicking this link. NION Beauty is the latest beauty gadget that bring a new life to every women's skin. 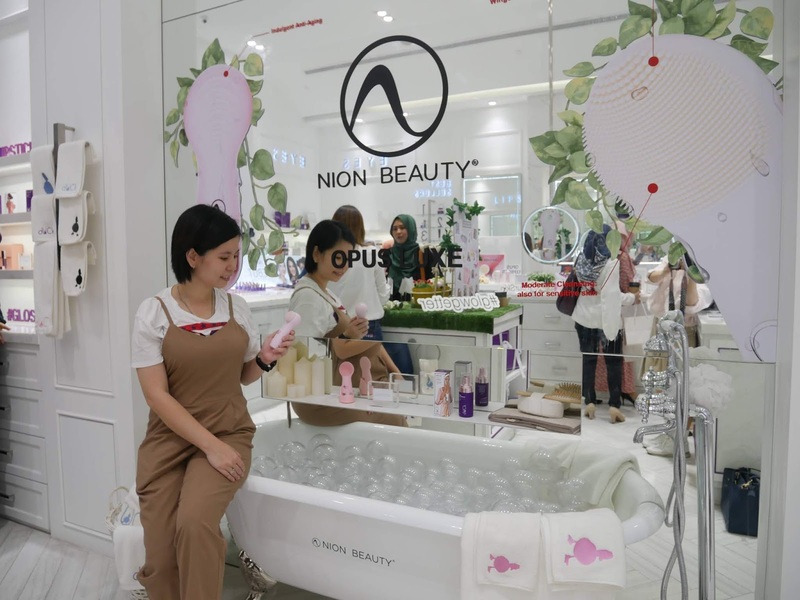 Recently NION BEAUTY organized a launch party at dUCk, Pavillion. The launch party was successful as media friends get to experience and know better about NION BEAUTY skincare cleansing device. NION BEAUTY is the world's first Negative Ion Silicone Skin Cleansing Device. NION BEAUTY is trustable cleansing device that can dep cleanse off the dirt and at the same time improve your skin texture. During the launch party, the staff demonstrate to us the right way to use NION BEAUTY and how NION BEAUTY help to target skin problem. By combining naturally occurring negative ions from rare earth elements with premium grade silicone, NION Beauty's silicone bristles really stand out from the ever crowded field of skin cleansing devices. The benefit to the user is simply beautiful: you can get complete cleansing without relying on harsh soaps and chemicals, resulting in naturally clean and beautiful skin. NION's Kinetic Skin Cleansing uses an up-down motion against the skin surface, eliminating friction caused by rotating scrubbing motion. Our clinical trials have proven that this method not only cleans better, but help keep skin more naturally supple resilient. Kinetic Skin Cleansing loosens impurities on the skin to be rinsed away, without causing microscopic damage caused by traditional scrubbing. The result is a healthier skin which retains its natural moisture and elasticity. The disposable Opus2GO offers all the benefits you'd expect from NION cleansing brush in a design convenient for travel. Opus express is battery operated. Opus Express featuring S-ion technology Silicone tip and ABS Body. Opus Luxe has rechargeable S-Ion Technology Silicone with 20% larger cleansing surface. Additional features with 3-speed of pulsating lifting massage vibration and come with an USB rechargeable battery.